Did you know you can now order your Deliveroo takeaway from Balans Soho Society here on View? Balans Soho Society is a relaxed restaurant serving a seasonal menu with signature dishes including steaks, seafood and burgers. 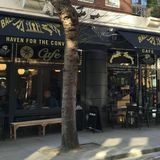 Do you work at Balans Soho Society?